It's not an easy task. Decentralisation has both benefits and drawbacks. It's just about making people see that the benefits outweigh the drawbacks. 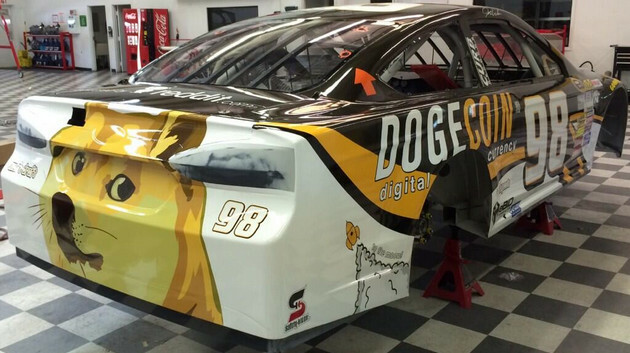 John Wise's NASCAR entry in the Aaron's 499 at the Talladega Superspeedway is wrapped and ready to race after raising more than $55,000 in Dogecoin, a Doge meme-inspired virtual currency. That's awesome hope it does well. What's everyone's thoughts on DOGE now? Been a while since there's been any activity, seems it still has a "value", although it appears to have hit a rut at around 40 satoshis, compared to the hundreds it reached earlier in the year. Only have around 3million DOGE left now, a lot was pushed over to BTC before the big rise and then some sold again for GBP at the top. If you can get anything then sell it, wont ever be worth anything good, bitcoin will eventually die as it will get linked to an actual terrorism event and get banned. Interesting idea, how would you go about 'banning it' exactly? Well weve seen that with fewer exchanges allowing the coin the value plummets, so not that hard at all to force countries to ban the exchanges. China issued a temporary ban at the end of november and bitcoin lost half its value from $1200 to $600, with mtgox crashing its never recovered the value. But yes im sure it cant be banned from all use blah blah, but then if you can limit the use of it and its not worth very much whats the point of using it anyway, from a nongeek ingame purchase perspective anyway. You'd probably have to spend far more to ban it that the actual value of the currency though tbh. And it's not like criminals and terrorists were ever really limited by having to use greenbacks/drugs/guns as currencies. I doubt it's ever going to be a currency recognised as part of the "legitimate / government sanctioned" financial systems anyway though, despite all the hype at the end of last year, that was never really what it was intended for and it was always conceptually a bit too confusing for the 'bloke in the street'. Anything happen to give it a reason to do so? Are we close to the 10,000,000,000 DOGE? New currency for an independent Scotland maybe?? Quick question' I'm still on 1.6 wallet; what do I do to update to 1.8? Seems to have changed a bit, there's an installer now, and I've not been paying attention for a couple of months? Worked it out, I needed to hunt down the -qt exe and not the installer, seems to be doing some mega update / reindex thing but my coins are appearing again. Last edited by omega; 14-09-14, 22:01.
i have my wallet keys stored from the android app. i want to transfer the wallet to my pc now but dont have an android phone anymore. is it at all possible lol ? Pretty sure the wallet is actually stored on the phone, so if you don't have access to that phone, it's gone. yes i backed the wallet up on the android phone then copied that file to my pc.